One of the critical components of an immobiliser system is the coil or antenna fitted around the ignition barrel. When diagnosing problems with the immobiliser system, there is always the question of whether the immobiliser antenna is transmitting a correct signal to power the key transponder. 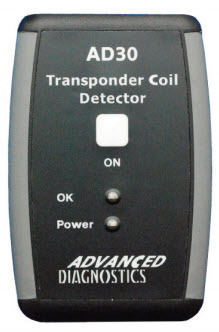 Now, by using the AD30 Transponder Coil Detector, this question can be quickly and easily answered and thus saving valuable time and money. The AD30 is placed near the ignition barrel in the steering column and provides a visual and audible indication of antenna power. Additionally on certain vehicles, by switching the ignition on, a further indication of a transponder signal being sent by the ignition key and received by the antenna can also be provided. 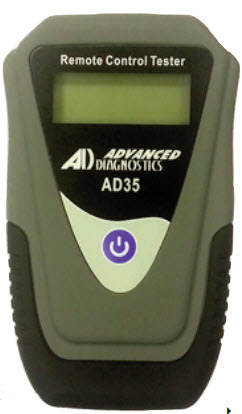 The AD35 Remote Control Tester has been designed to offer a quick and accurate way to test radio frequency (RF) remote controls and also infra-red (IR) remote controls. It offers a simple check that the remote is sending a signal, but more important that the frequency it is sending is correct. This is important for imported vehicles and systems, as there are a number of different frequencies used across the world. Other features include a rear magnet so the unit can be fixed inside a van for easy storage, or if you are working on a vehicle or engine it can be fixed somewhere safe and not slip off. An automatic power off also helps conserve battery life. 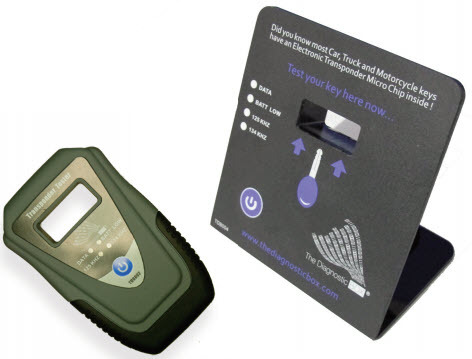 The new TDB002 & TDB004 Transponder Key Testers offer a simple check to ensure a key or remote control has a working transponder fitted and also provides a fast and easy way to check if the transponder is responding. These innovative Testers enable locksmiths, to show customers that their car, truck or motorcycle key has an electronic transponder located inside the key, which will help boost the sales of transponder key replacements. You can explain to the customers why it is so important to have a spare key – owing to the cost of lost key replacement when transponders are involved. In addition, it is not always easy to check whether there is a transponder fitted when diagnosing vehicle key and immobiliser problems, and so these Testers offer a simple cost-effective solution, saving both time and money. KeyDIY (KD200) allows you to generate a large range of remotes onto 5 styles of remote, cutting down stock holding and increasing your flexibility. New applications are being released on KeyDIY for the UK market. See www.keyDIYuk.com for the latest applications information. The WIKI OBD is a free Diagnostic Socket Locator and WIKIRKE is a free remote control programming guide. The web sites have been designed to work best with Smart Phone screens but can also be used on PCs, Tablets and other devices. Have you ever been out trying to locate a diagnostic socket, spent 5 minutes or more hunting around, taking off panels, unscrewing parts of the car, called a friend to see if they might know and it took you longer to find the socket than it did to diagnose the problem. I am sure we have all been there? Well now there is a simple and easy way to find the location of the diagnostic socket and the great thing is, it’s FREE! Initially the web site has been populated with mostly cars, but additional locations for Trucks, Boats and Motorcycles will be added. It will save you time and money, and some embarrassment in front of the customer! Why not give it try? Q. Where can I source remotes, keys and transponders? A. Check The Advanced Keys website to the full range of original remotes, keys and transponders. We can offer advice on which part to buy to make sure that you are getting the correct part to save time and costly mistakes. AK also offer a large range of cases, screws and pins is available to allow the repair of faulty/old remotes. Q. Can I source Silca vehicle keys, electronic keys and Silca machines and spares from you? A. Yes we are a full Silca stockist but we have concentrated on the Silca MH & FH ranges to offer more flexibility as not only can you use the new MH electronic heads which can be used for copying 4C, 4D and ID46 transponders using the Silca cloning equipment but there is an adaptor available which allows small glass, carbon and large glass transponders to be used. The MH range electronic head and adaptor head both clip onto the empty blade half of the key and provide a neat, quality transponder key at an affordable price and the FH flip key range offers a neat up-to-date solution to providing a transponder key for a spare key or cost effective solution.